We all know greens are healthy for us. But lets be honest, they aren’t the most exciting of things. That is, unless you can find a way that will make you want to eat them. Many people throw greens into their smoothies, on pizza (my fave!) and have simply as a side with dinner (I like it this way too). I wouldn’t say they’re my favorite food, but I know they’re good for me, and I don’t mind them, so I try to eat them as often as I can. Frozen vegetables can really be a hit or miss. I happen to hate the taste of frozen carrots. They don’t taste like carrots to me once thawed….just funky orange things that sorta resemble carrots. You can’t beat the convenience of frozen though. Many people worry about nutritional value, but they can actually have a lot of vitamin and minerals if they are frozen shortly after being picked (but unfortunaly, not all companies do this). So I was definitely curious when Cookin’ Greens was in touch with me about trying a sample of their product. Sure! I was game. 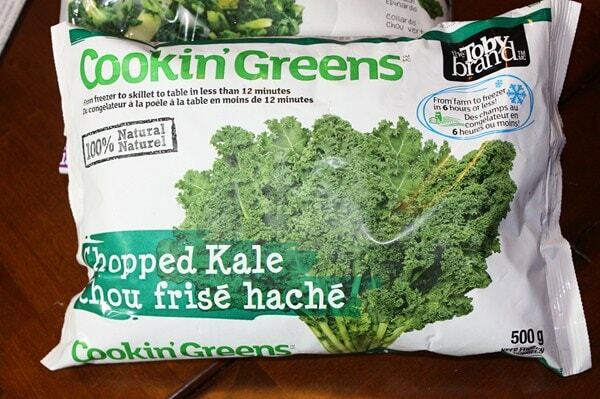 When I saw they had kale, I was pretty stoked, as I actually prefer it to spinach. I also picked up this cool “Designer Mix” (which I got into before I snapped a pic). Its a combo of spinach, collards, rapini, yellow beans & onion. – They have a TON of recipes and recipe ideas on their site. – Super low calorie and tons of vitamins! They were really good! Not like a block of frozen spinach at all. Once cooked, I couldn’t tell it was even frozen. Identical to when I chop up regular kale and cook it. The designer mix was great too. I liked the combo of vegetables. Not what you’d typically get in a mix. Since I loved it so much, the folks at Cookin’ Greens were game for a giveaway! So watch for that posting on Monday, in addition to a new recipe. Unfortunately, Cookin Greens is only available in Canada at the moment, but keep your eyes peeled for availability in the US. If you can’t wait and want some now, check out their store locator (by province). I got mine in the health food section of Superstore (Loblaws). These actually look really good! Wish they were in the US! I know, its a bummer. Hopefully soon!